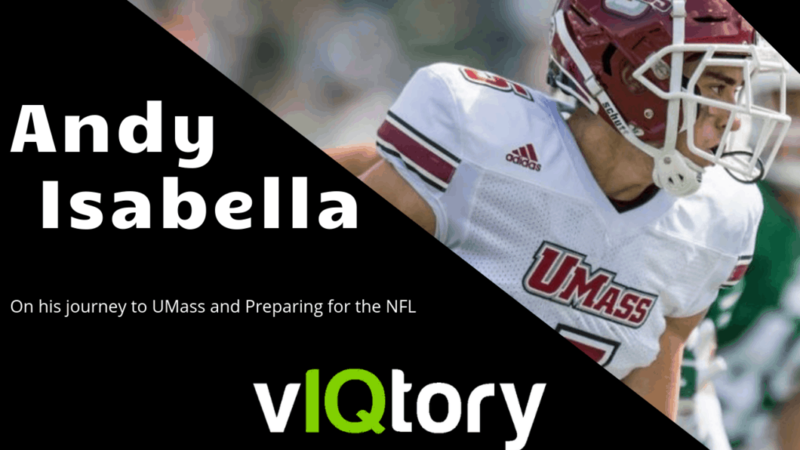 On this episode of the vIQtory podcast we are joined by 2018 All-American Wide Receiver and Senior Bowl standout, Andy Isabella. Andy just wrapped up his Senior year at UMass where he led the nation in receiving. His year ended with 102 catches, 1698 yards and 13 TDs on his way to being named a Biletnikoff finalist among other awards. We caught up with Andy after his season ended and he began training for the Senior Bowl, Combine and ultimately the NFL Draft. To learn more football and see our other podcasts, visit viqtorysports.com! Steve McGrath: Welcome back everyone to the vIQtory Podcast. I am Steve McGrath alongside Chris Haddad and today we have a very special guest. As a UMass Amherst alumni, nothing makes me happier than having another UMass guest on here. But, we don’t have just any other UMass guest, we have with us an All-American wide receiver, Biletnikoff Award finalist, 2018 – this past year, his senior year, a 102 catches, 1698 yards, 13 touchdowns – led the nation in yards per game, led the nation in receiving yards, PERIOD. None other than Andy Isabella. Andy thank you so much for coming on with us. SM: When you hear all that, do you like – has it sunk in yet? You did that this year from UMass, a school that obviously isn’t notoriously known for those, you know, guys putting up numbers like that. Has it really sunk in? SM: That’s awesome man and it and I mean just you were just recently at the award show for the Biletnikoff award that what’s it like going out to like these big, big time award shows where you’re going out there the next thing you know you’re gonna fly back to Amherst to take a final? Chris Haddad: Yeah you’re coming back to the campus now and you know you changed your major to what now – advanced mathematics you were saying? CH: so what’s that been like going from red carpet to Umass and advanced mathematics? you get a turn off one side of your brain and turn on another? CH: And I’m sure that’s been a whirlwind for your family as well because you know you go to UMass Amherst, advanced mathematics degree, I mean when did the NFL really become in the limelight for you was it just this past year, past two years, you know – when did your family at least be like you might be playing in the league next year? CH: Now how much did your track career play into your football career? you know and I want you to phrase your answer in a way that if a younger kid is looking to run track you know but it’s kind of on the fence about it and you want to sell them on it – what would you tell them? SM: You come to UMass and you actually start as a running back – what was it like for you just going from our running back and you know UMass is probably thinking we have this really good athlete, but we don’t really know how to use him. How do you go from that to having this season that you just had how do you just make those jumps to converting to a wide receiver and then not just being a useful one but the best one in the country? CH: you guys have a pro day at Umass that you’re putting on or are you gonna go – ? CH: okay that’d be cool. so I gotta ask you’re listed as 5’9” is that correct? SM: Now I wanted to ask you just you know based on your UMass experience of course you watch tape on NFL guys I’m sure you watch some NFL in general is there like a certain type of scheme or a style of coaching that like you hope that on the next level you know you get to fit into a certain type like is there anything in particular they like I really hope that wherever I get drafted they do ‘X’ ? SM: in this is the last one before we jump into the gauntlet which we’ll end on, what advice would you give from where you’re sitting now to 16 17 year old football player that wants to make it to the NFL one day? SM: Defense wins championships, no problem. Best hangout spot in Amherst? SM: Well what about the best place to eat in Amherst? football best football memory to date? CH: What’s that now is that like eight yards give a little hitch to the outside?